Students from Augsburg College’s biology and chemistry departments presented their research findings at a conference for the American Society for Microbiology (ASM) in Toronto, Canada, May 20-25. 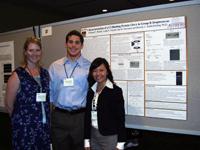 Their presentation, “Characterization of a C3-Binding Protein GbcA in Group B Streptococcus,” was first authored by Richard Birkett ’07, Linda Huynh, Dan Hayward ’07 and their research mentor Beverly Smith-Keiling. Their research defines a novel function for a protein vaccine candidate. Birkett, recipient of a prestigious ASM undergraduate research fellowship, was selected as one of 43 competitively awarded nationally. He was also one of 10 undergraduates chosen to present the research orally. Augsburg’s Office of Undergraduate Research Graduate Opportunities (URGO) supported both Birkett and Huynh. Huynh was also awarded a competitive travel grant from the Sigma Delta Epsilon chapter of the Women in Science and Engineering (SDE-WISE). Hayward coauthored research through directed studies credit and will attend medical school in the fall.